Nicolaes Maes, also known as Niclaes Maas (Dordrecht 1632-1693 Amsterdam), was a Dutch painter of genre scenes and portraits. Maes was the son of Gerrit Maes, a prosperous merchant, and Ida Herman Claesdr. About 1648 he went to Amsterdam and entered Rembrandt's studio. Before his return to Dordrecht in 1653 Maes painted a few Rembrandtesque genre pictures, with life-size figures and in a deep glowing scheme of color, like the Reverie at the Rijksmuseum in Amsterdam, the Card Players at the National Gallery, and the Children with a Goat Carriage. So closely did his early style resemble that of Rembrandt, that the last-named picture, and other canvases in the Leipzig and Budapest galleries and in the collection of Lord Radnor, were or are still ascribed to Rembrandt. In his best period, from 1655 to 1665, Maes devoted himself to domestic genre on a smaller scale, retaining to a great extent the magic of color he had learnt from Rembrandt. Only on rare occasions did he treat scriptural subjects, as in Hagar's Departure, which has been ascribed to Rembrandt. His favorite subjects were women spinning, or reading the Bible, or preparing a meal. While he continued to reside in Dordrecht until 1673, when he settled in Amsterdam, he visited or even lived in Antwerp between 1665 and 1667. His Antwerp period coincides with a complete change in style and subject. He devoted himself almost exclusively to portraiture, and abandoned the intimacy and glowing color harmonies of his earlier work for a careless elegance which suggests the influence of Van Dyck. So great indeed was the change, that it gave rise to the theory of the existence of another Maes, of Brussels. Maes apprenticed with Rembrandt from about 1648 to 1654, where he focused first on genre paintings and then on portraits. This drawing was probably done while he was in Rembrandt's studio or shortly after leaving it to return to Dordrecht and set himself up as a master. As Marian Bisanz-Prakken says in Rembrandt and His Time: Masterworks from the Albertina, Vienna (NY: Hudson Hills Press, 2005), "In Maes's studies of biblical and mythological scenes, which are mostly executed in pen, sometimes in combination with the brush, Rembrandt's influence is clearly evident. . . . In these representations, the typological rather than the portrait aspect comes predominantly to the fore" (p. 108). Robinson's entry in The Art Dictionary (20: 78-81) argues that "Though indebted to Rembrandt's example, the early religious works exhibit a precocious originality in the interpretation of the sacred text and iconographic tradition" (78). Williams further suggests that "for a brief period in the mid-1650sthe most likely date for our drawingMaes ranked among the most innovative Dutch genre painters, owing to his talent for pictorial invention and for devising expressive poses, gestures, and physiognomies." For Rembrandt and his friends, students, and followers, there often seems to be a direct connection between drawing and printmaking. Artists like Ferdinand Bol, Govaert Flinck, Jan Lievens, Nicolaes Maes, Jan Joris van Vliet, and Pieter de With, are fluent draftsmen and often excellent printmakers as well. While the Counter Reformation held sway in the south, in the north, in Holland and Zeeland, Jesus, the Apostles, and their predecessors in the Old Testament, walk the same ground that burghers, beggars, farmers, and peasants tred, work the same fields, trying to coexist with nature and yet to wrest it to their needs. Biblical stories, landscapes, and portraits can be a way to connect the present to the past and the future. Very select bibliography: Marian Bisanz-Prakken, Rembrandt and His Time: Masterworks from the Albertina (Milwaukee: Milwaukee Art Museum, 2005); Hans-Martin Rotermund, Rembrandt's Drawings and Etchings for the Bible, trans. Sherry M. Weber (Philadelphia: Pilgrim Press, 1969); Seymour Slive, Drawings of Rembrandt, 2 vols. (NY: Dover. 1965); Jeroen Giltaij, The Drawings by Rembrandt and his school in the Museum Boymans-van Beuningen (Rotterdam: Museum Boymans-van Beuningen, 1988); Walter Sumowski, Drawings of the Rembrandt School, 10 vols. (NY: Abaris Books, 1979-1992)see volume 8 for Niclaes Maes (including the drawing below). Nicolaes Maes (Dordrecht 1634-1693 Amsterdam), The Prophet Nathan rebukes David. Pen and brown ink and wash on laid paper, c. 1650-1660. From the roof of his palace, David sees Bathsheba engaging in her ritual purification bath at the end of her period. He sends for her, seduces her, and she conceives a child. Her husband Uriah the Hittite, one of David's captains, comes home, but will not sleep with his wife while his comrades are in battle (and thus making it impossible for David's child to be passed off as his), so David orders Joab to set up a way of getting him killed in battle. After Uriah's death, David then marries Bathsheba. The situation depicted in this drawing is described in 2 Samuel 1-15. God sends the Prophet Nathan to call David back to obedience. Nathan tells David a story about a rich man who kills his neighbor's only lamb to feast a traveller even though he is rich and his many sheep of his own. David condemns the rich man to death only to have Nathan tell him, "You are the man! Thus says the LORD, the God of Israel: I anointed you king over Israel, and I rescued you from the hand of Saul; I gave you your master’s house, and your master’s wives into your bosom, and gave you the house of Israel and of Judah; and if that had been too little, I would have added as much more. Why have you despised the word of the LORD, to do what is evil in his sight? You have struck down Uriah the Hittite with the sword, and have taken his wife to be your wife, and have killed him with the sword of the Ammonites" (7-9). Maes has illustrated the moment when David cowers in fear of the Lord's wrath and repents. 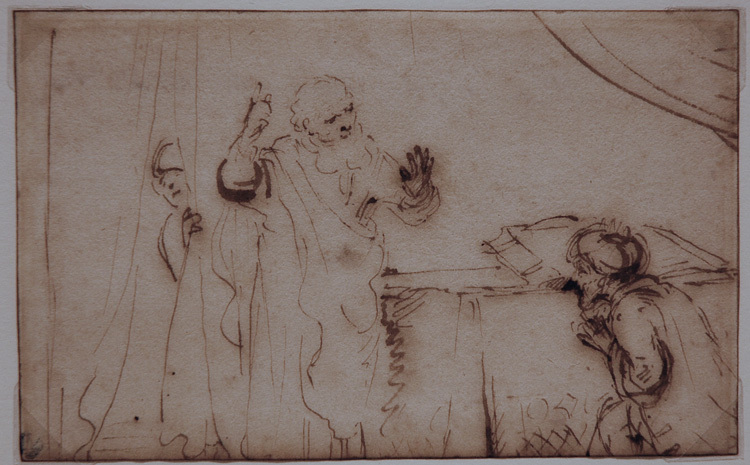 This drawing is illustrated in Walter Sumowski's Drawings of the Rembrandt School, 10 vols. (NY: Abaris Books, 1979-1992), vol. 8, pp. 4298-99, catalogue n. 1922x. It is located in the section of the book entitled "Substantiated Drawings" (the section occurs before drawing n. 1904x). Sumowski lists as provenance "H. Oppenheim" and says that it was "formerly" in the collection of C. R. Rudolf. At some point after the publication of Sumowski's volume on Maes, the Rudolf collection seems to have been sold off, in whole or in part, and ultimately the drawing illustrated in Sumowski came to us via auction. It has also been published in William W. Robinson, Rembrandt's Sketches of Historical Subjects (1987), p. 256, fig. 22. Image size: 102x160mm. Price: $25,000.